Not far from Farmington in northwest New Mexico is Bisti Badlands, a nearly vacant 42,000 acre patch of desert punctuated by undulating mounds and otherworldly sandstone formations called hoodoos. After photographing in Chaco Canyon for a couple of days I drove north into Bisti, pronounced Bist Eye. 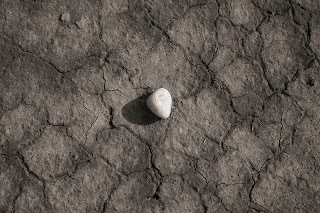 Then, as often happens with me, the spawn of my original mission to photograph the lumpy hoodoos became a still life of a heart shaped stone resting on the parched earth. This misdirection is symptomatic of an undiagnosed condition or I stopped to tie my shoe. Bisti was once covered by an inland sea and has been inhabited, albeit lightly, for 10,000 years. Remnants of a Chacoan society are abundant as is the burned hulk of the old trading post. These worthy subjects along with the mounds, hoodoos and shallow arroyos that riddle the landscape would fill a book for Pete’s sake. And all you get is a stupid rock. This is a stunning image. In addition to its intrinsic beauty, the feeling of it reflects endless possibilities for commercial applications. Barrels full of kudos, Steve. What commercial applications pray tell?